Greed + Politics + Toxic Fracking Chemicals in the drinking water supply = CANCER! Toxic Chemicals and Radiation Exposure! Many scientists aware of the water pollution issue believe that WV DEP is Sacrificing Public Health for PROFIT. WV DEP has been fully aware of the water and air pollution issue in Lochgelly WV for the past several years. Despite numerous violations, they continue to allow DWC to dispose of toxic and extremely RADIOACTIVE Fracking/Drilling wastewater just upstream of the area's drinking water supply. According to the federal EPA, hydraulic fracturing wastewater is a mixture of HUNDREDS of chemicals, many of which are cancer causing chemicals, endocrine disruptors, as well as extremely high levels of TENORM (technically enhanced) Radiation. Despite public outrage, WV DEP OOG allowed this toxic fracking waste to sit in large sediment pits for several years. According to Webb, WV DEP advised him to construct the large sediments, which set within a few feet of the headwaters of Wolf Creek, in an effort to save Webb money. WV DEP allowed this toxic waste to sit in these large pits for several years, which caused air pollution for area residents, until the pits were FINALLY closed in June of 2014. In April of 2013, WV enacted Senate Bill 243, which was introduced by WV DEP. The laws blocks the public from knowing the long list of toxic chemicals used in fracking and protects the Fracking Industry! Click here for TENORM Radiation Exposure. Click here for Water Quality & Senate Bill 243. Many citizens of Fayetteville, Oak Hill and Lochgelly are outraged at WV DEP's failure to protect public health. Since 2004, WV DEP has received numerous complaints about the leaking sediments pits (containing Hydraulic Fracturing wastewater), polluted stream, and odor from the Lochgelly injection well site. For the past several years, WV DEP has claimed that the water contamination is caused by acid mine drainage. However, a recent study conducted by Duke University, confirmed that the contamination is caused by Hydraulic Fracturing wastewater (drilling), not acid mine drainage. According the the EPA and USGS, hydraulic fracking (oil and gas) wastewater is a mixture of 700 hundred chemicals, many of which cause thyroid disease, liver and kidney disease, nervous system damage and CANCER. West Virginia coal mines are used for the Disposal of toxic and radioactive Frack waste... Click to read the "very revealing" OPEN LETTER that was sent to Dr. Rahul Gupta in February 2015. Wolf Creek leads directly to the current water intake which is only a few miles downstream from the Lochgelly injection well site. It served as the primary drinking water source up until October of 2008 and continues to be used as the back up water supply. This is a major concern for many area residents, especially since the sediments pits began leaking into the headwaters of Wolf Creek in 2003. Duke Professor: Water samples show fracking contamination in Wolf Creek. Click here to read the news article. WV Senator Unger Fights to Protect Drinking Water From Radiation in Berkeley County. Click here to read the article. History of Complaints to WV DEP: WV DEP Office of Oil and Gas received complaints in 2004 about the leaking sediment pits and the odor coming from the Lochgelly injection well site. The Wolf Creek drinking water contamination issue was first brought to WV DEP's attention when Brad Keenan, a concerned Lochgelly resident, presented and submitted water tests results and video evidence indicating that Wolf Creek was contaminated with fracking chemicals, to Jamie Peterson at a Public Hearing on whether or not to renew Danny Webb Construction's injection well permit in 2007. Shortly after the public hearing, the same evidence was certified mailed to Governor Manchin's office, but no response was ever provided. Poiso ning the water supply with toxicchemicals isa state and federal crime, but instead of addressing the water pollution issue, the WVDEP renewed Webb's injection well permit for another 5 years, enabling him to continue putting the drinking water supply at risk. In June of 2013, another public hearing was held to consider the renewal of Webb's injection well permit. Dozens of concerned residents and health professi onals attended and expressed strong opposition to the renewal ofthe injection well permit. During the hearing, evidence of Webb's long history of violations were presented by the Sierra Club West Virgnia Chapter and many other environmental organizations. One of the most compelling testimonies came from one of Danny Webb's former employees, Mr. Peter Halverson. He informed the audience that Webb hadhimplace a new sediment pit liner over the old leaking sediment pit liner, which allows the toxic waste to continue leaking directly into Wolf Creek. In addition, strong laboratory evidence was presented and submitted that indicated that Wolf Creek was still contaminated with fracking chem icals. Click here to read the 2nd letter that has been sent to the WVDEP by the NRDC regarding Webb continuing to operate the frack dump without a legal permit. 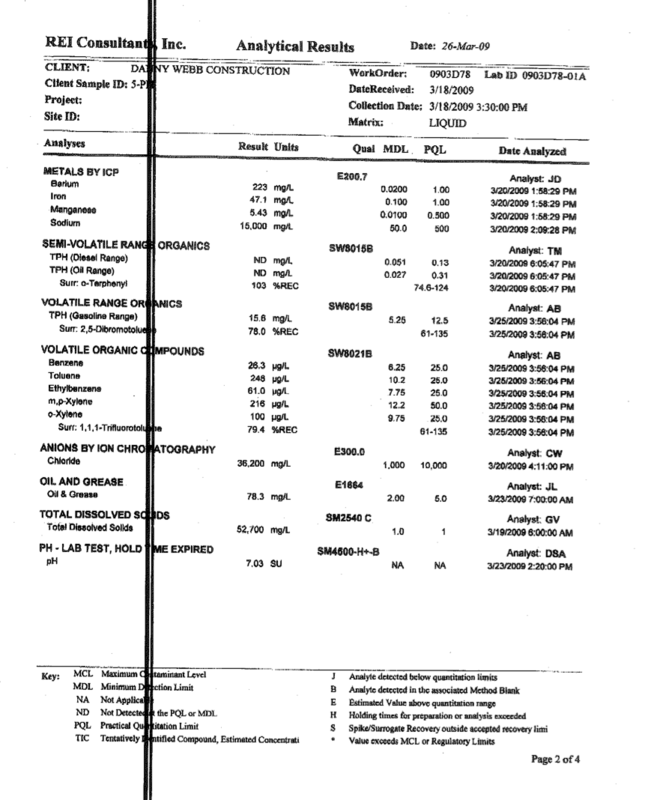 Some of Danny Webb's own testing shows that the Fracking Wastewater which was allowed to sit in the sediment pits for several years had extremely high levels of Endocrine Disrupting and CANCER causing chemicals in it. Click here to view test results. This is a temporary website being used to make the public aware of the ongoing air and water pollution which threatens our health, our property values, our tourism industry, etc. Photos and Videos of the Lochgelly WV Injection Well Frack Dump. Duke University Confirms that Wolf Creek is Contaminated with toxic Hydraulic Fracking compounds. Chemicals and Radiation in Fracking Wastewater Causes Major Health Problems! Click here. Articles about Wolf Creek Water Contamination, Related Health Risks, etc. Click here. What is Hydraulic Fracturing “Fracking”? Click here. History of Violations Ignored by WVDEP. Read comment letters from the NRDC, PAN, WVHC, etc. 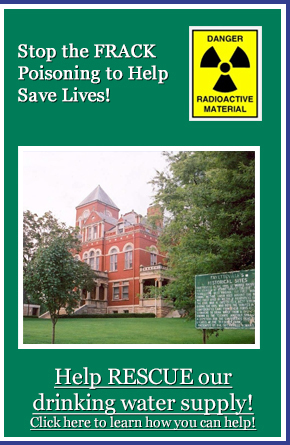 Ban Toxic and Radioactive Fracking Waste in Fayette County Click here. Why Other States and Cities have Banned Fracking & Toxic and Radioactive Waste! Links to Helpful Articles and Resources. Click here. Copyright 2015 Concerned Health Professionals.